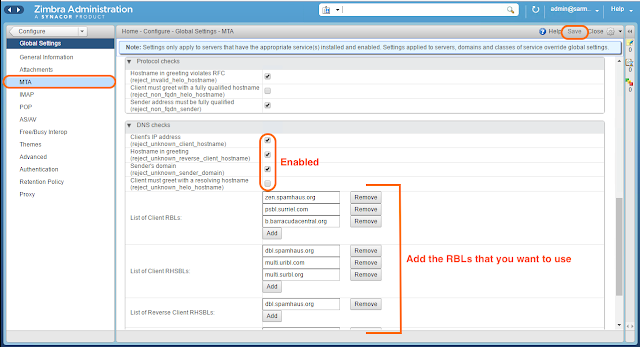 Enable DNSBL or RBL on Zimbra | Bots! Then, go to Global Settings. Next, go to MTA. I’ve enabled some parameters to harden the server, and added the RBLs that Zimbra supports. You could add the RBLs of your choice here. There no need to do any service restarts. Zimbra should detect (zmconfigd) the config changes and apply them. Login to the server, and switch to the user zimbra. First, let us check if there are any existing policies in place. Great! Now let’s add a couple of RBLs using zmprov. Zimbra uses the these RBLs. That’s it. There is no need for any service restarts, zmconfigd should detect the changes and push the config to Zimbra and postfix. No matter whether you made the change using GUI or CLI, the troubleshooting and verification method is the same. May 3 22:36:05 mail zmconfigd: Watchdog: service antivirus status is OK. The changes also reflect in the output of zmprov command. Finally, postfix is the underlying service that would do the actual RBL checks. We can verify if the parameters have been injected to postfix using postconf. 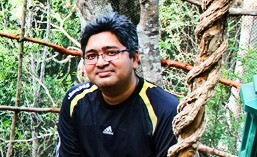 This entry was posted in Administrations, Configurations (Linux) and tagged DNSBL, RBL, zimbra. Bookmark the permalink.